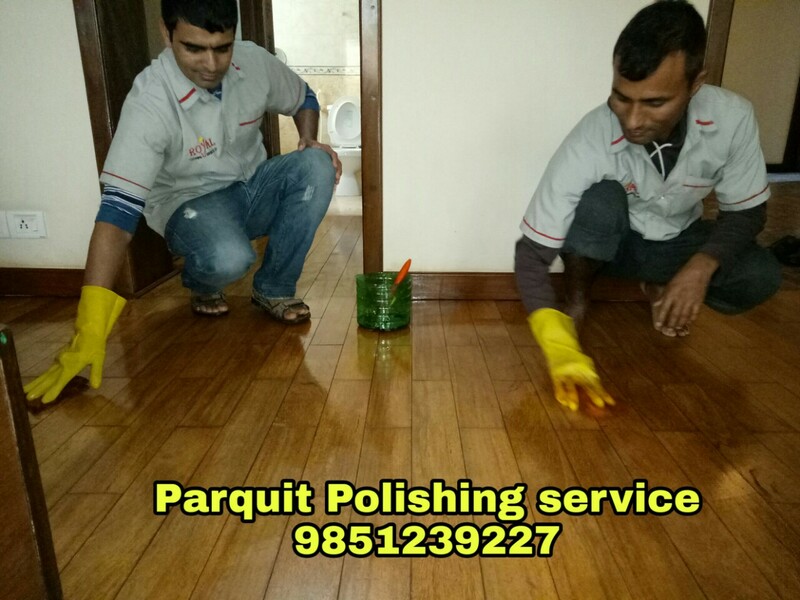 We are the professional Parqueting Polishing service provider in Kathmandu Nepal. We use various chemicals and machine to leave a fine shine or glow on our customers. We have the latest technologies to provide wooden floor polishing service. All most any condition parqueting floor or wooden floor will be polished with a very good glow on the floor. Parquet is a classy interior design to keep the floors from looking dirty. Composed of geometrically placed wooden blocks, parquet enhanced the surface of your floor to make it look elegant. However, it requires polishing from time to time since its loss the gloss after frequent use. Although parquet can be cleaned daily, it is very important to polish it once a while to give it the glossy look that it had when you first installed it on your floor. The wooden floors are known best for its ease of cleaning on a day to day basis. Since the wooden floors don’t trap the unpleasant odors unlike carpets, they are known to be better than fabrics. These parquets also last for years and years if only it is maintained properly. Parquets are prone to moisture damage so it is essential to keep the space well ventilated to manage humidity. They are also susceptible to scratches which is why you need to be extra careful not to bring small and sharp object son the parquet floor. We also give you other suggestions for maintaining your Parquet floors. What does our parquet polishing service offers? Savvy homeowners often dread the dullness of the parquet and take the rash decision of calling whoever they know for repair. However, parquet is immaculately patterned wooden strips which need high care and maintenance. We offer to grind and sand the floor. Before sanding we clean the floor using vacuum so that the dirt stuck between the strip is completely removed. Our imported sanders come with round pads which will remove the filler and cuts down the finish. The grit papers will give a finish to the floor. Over time the parquets lose their touch and also the strips might loosen up. So for this problem, we offer the service of refilling the gaps in between these strips so that they do not trap any dirt and dust and is easy to clean. Also filling these gaps make the parquets look structured. Since the gaps on the parquet floor are more widespread than planks, this problem needs to be addressed. We spread floor filler all over the floor. We also use latex filler to a thin pourable consistency. We offer the service of sanding through orbital sanders and polishing it in the high traffic area. To take off the old coating, the highest grit is used. The polished finish can be either oil or water based. The foam covered applicator tube spreads the polish. Different sanding screen is used for this job. Parquets are in itself classy and enhance the beauty of the room. However, a small broken parquet can ruin the beauty of the entire floor. Thus maintenance is a must. We note the condition of the parquet and remove the broken or damaged parquet. The parquet strips which have been broken or are completely damaged can be replaced with a new parquet. We re-glue the loose strips into place or place new parquet strips. Royal Cleaning Services is an expert in polishing floors and particularly parquets inside Kathmandu Valley. We use special chemicals and machines imported just to give your floors a polished wood finish that looks new. We also wax your parquets. We remove all the scratches along the process so that the floor returns to its actual color. You can fully rely on us for restoring your parquet. We keep up with the latest technologies in cleaning services. So we know what is to be used for efficient and effective results. We use tools imported from abroad and are also well aware of the new techniques. Our skilled professionals have the entire service under control. They have many years of experience in parquette. They know how to work in the most environmentally friendly way so that no harm is done to the surrounding. Rest assured! We have got you covered. You can entirely be assured that when we lay our hands on your parqueting floor we will not leave without the best outcome. Our guaranteed service will certainly keep you satisfied at the end of the day. Since the time we began providing this service, we have an assured customer satisfaction with positive feedback. We are responsive o your needs and cater to it accordingly. As per the services that we offer under Parquet polishing, we are proud to say that we are not as expensive as you would think. We have the most reasonable pricing for our services that will not leave a hole in your pocket. Be assured that the price range that we have set are well below the competitive pricing line. Has your parquet lost its polish and become dull? Then it is time that you pick up your phone and call Royal Cleaning Services immediately. We provide services around Kathmandu valley.